Kruger reveals that Celebrity Big Brother “is still being talked about” and that “they are kind of looking at the casting” comprising of some “big international names”. Kruger is also adds that the Channel Nine 2015 schedule is “is pretty packed” and if they did do Celebrity Big Brother it would “be a slightly shorter run”. Celebrity Big Brother last aired in Australia in 2002 running for just 24 days. Also discussed was the possibility of a regular Big Brother season returning this year but that appears unlikely with Kruger describing Channel Nine “haven’t even gotten to that” and “it is turning out to be a busy year”. Meanwhile, Katie Price, has taken to Twitter to deny the speculation around her being an Australian Big Brother housemate. This rumour has been circulating in newspapers locally and abroad (Sunday Telegraph, The Courier Mail and The Sun – UK) and is believed to have developed in response to Price’s previous announcement of 3-month Australian stint later this year via a cross on The Morning Show, as reported previously. Price’s ex-partner Peter Andre has also reportedly been contacted about appearing on Celebrity Big Brother Australia but a spokesperson has responded saying “he declined the offer”, according to British magazine OK!. The important detail here is the confirmation that Channel Nine are making efforts to shortlist a cast for a possible second series of Celebrity Big Brother Australia. 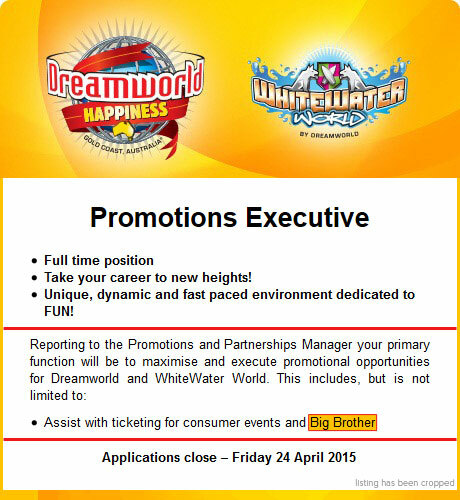 And finally, Dreamworld’s parent company Ardent Leisure has recently been advertising a full-time job vacancy for a Promotions Executive. One of the responsibilities of this role is to “Assist with ticketing for consumer events and Big Brother“. At this time there has been no official word from Channel Nine confirming or denying the Celebrity Big Brother speculation. I am interested… a good way of revamping a show that has seemingly running out of ideas. As expected, D-list names will be cast; but hey, it worked for I’m a Celebrity. Prediciting: Patti Newton, Deanna Jolly, perhaps Shaynna Balze? This is true, although it would be fun to have Big Brother back even for a short period of time.